Brown Bluff (Washington County), 1994. Brown Bluff, in the Boston Mountains, was first excavated by archeologists in 1932. 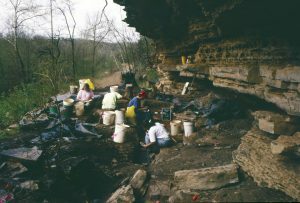 The excavations were part of a project conducted by Samuel Dellinger and the University of Arkansas Museum to collect material from the bluff shelters in the region. Additional excavations were conducted in the 1990s when the site was impacted by the construction of what is now Interstate 49. The contract archeology firm SPEARS Inc. conducted the first phase of this project and the Arkansas Archeological Survey completed the second phase. In addition to targeted new excavations, the work in the 1990s reexamined the collections and notes from Dellinger’s 1930s work. One of the most remarkable and compelling finds at the shelter, and one remembered by many who visited the University of Arkansas Museum before the mid-1970s, was the partially mummified, buried remains of an adult woman with a dog close to her feet. The woman was determined to have been between 35 and 49 years of age at the time of her death, and was buried with possessions and covered in a woven material that might be interpreted as a shroud. She was found with several pieces of basketry and cordage. One woven object may have been either a sling used to throw rocks or a device called a tumpline used for carrying objects that you could tie to yourself—an early backpack if you will. She was also buried with a bone awl that one could imagine her using in life to punch holes in hides or fiber. The most compelling object may be a brush that was found in the burial. It was interpreted at the time as a hair brush and does resemble historic examples of Osage hairbrushes. It is possible that it is a brush used for other purposes such as fiber processing, or possibly it had multiple uses. The very personal nature of this item and the ability it gives us to imagine daily life for people in the Ozark past is what makes these objects so valuable and interesting to researchers and the public alike. 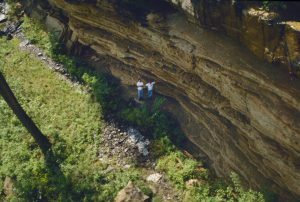 1994 excavations at Brown Bluff (Washington County). The dog burial is also something that we can relate to. Dogs have a long history with humans. They were probably the first animals domesticated by early peoples. They were certainly the only animal domesticated in North America before European contact. Dogs would have been useful to Native Americans in a variety of ways from hunting to security. The burial of the dog in a grass- and leaf-lined pit a meter from the burial of the woman in the direction of her feet may speak to the role of dogs in the culture of the people who lived at these sites. Even if the interpretation of these two burials as connected events is wrong, the fact that the dog was buried purposely in a pit lined with grass and other plants means thought was put into the act. You can imagine a close tie between the two that might have existed in life. However compelling this burial is, its display in a glass case in the museum, while considered acceptable in the 1930s, is now considered unethical. While the artifacts from bluff shelters and the data they represent are interesting and compelling, human remains are more than just data—they are people. They must be treated with respect and in accordance with the wishes of the Native American groups that are descended from these prehistoric peoples. This means that the display of human remains or any associated material—anything buried with the body—should not be put on display.